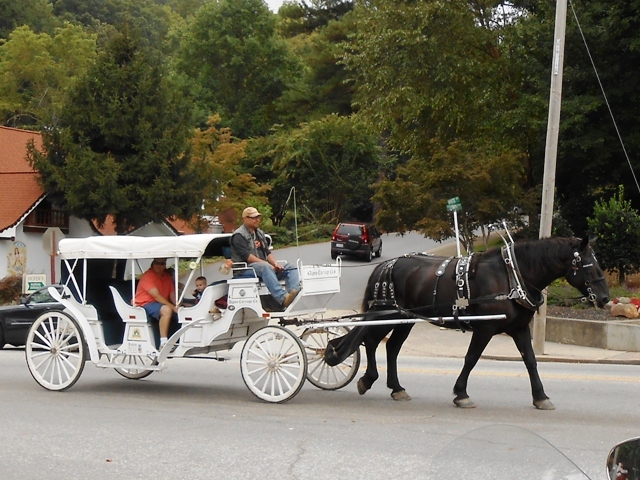 On Tuesday September 24, 2013 we took another Day Ride. 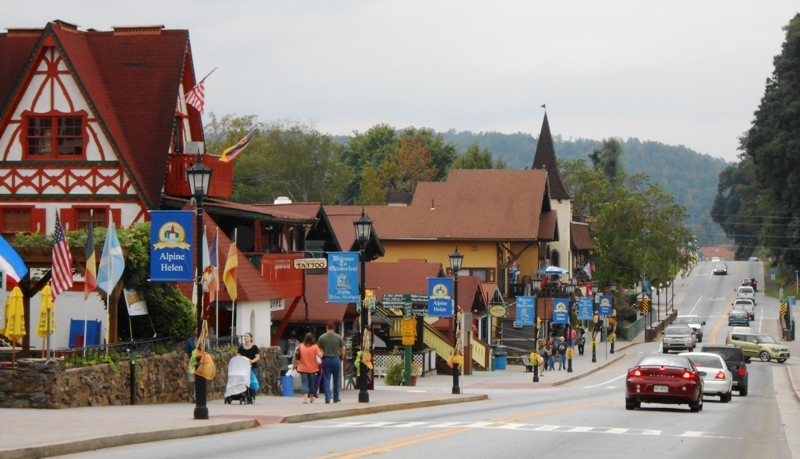 Our destination was Helen, Georgia, a small tourist town in the North Georgia Mountains. Leaving from our home in North Knoxville. It was a cool 60 degrees with cloudy skies when we left our home in North Knoxville. 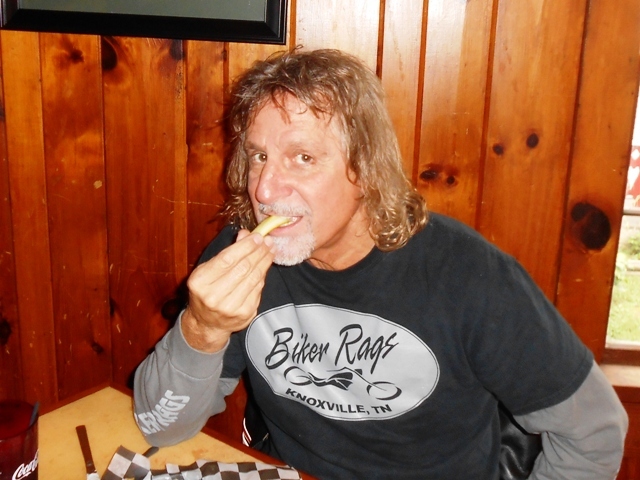 We took 640 to West Knoxville, got on Kingston Pike and rode west to Lenoir City and then on to Loudon. In Loudon, we took 72 to 411 and then took 411 to Madisonville. Once in Madisonville we took 68 south heading toward Tellico Plains. We stopped on 68 for gas and a light snack. 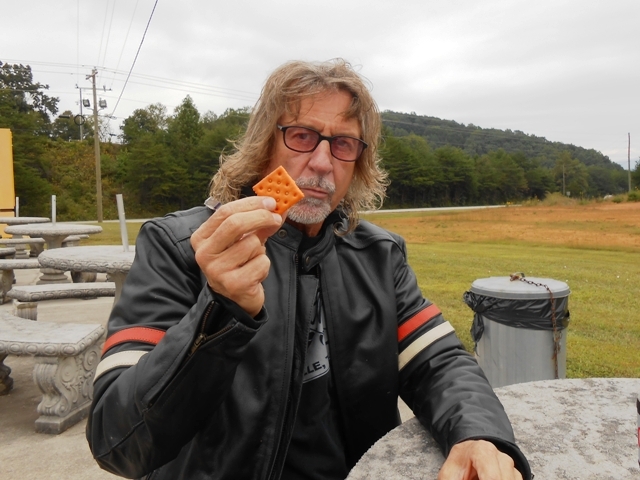 Stop on 68 for gas and a light snack. 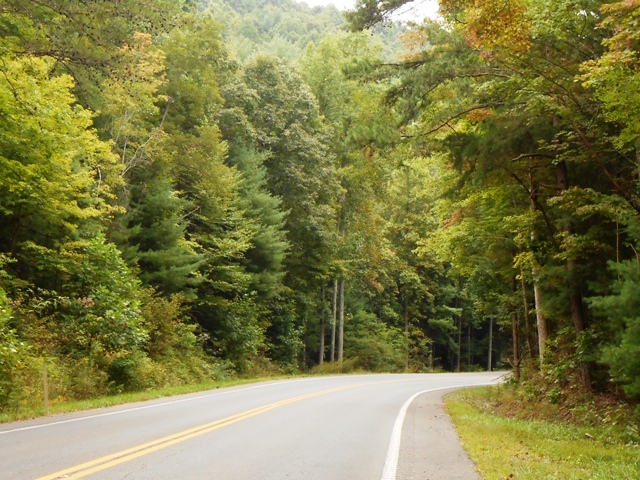 After our break, we continued south on 68 through Tellico Plains, Coker Creek and on to Copperhill, which is right at the Georgia border. In Copperhill, we took 60 south to Blue Ridge, Georgia. In Blue Ridge we took 76 east to Blairsville, Georgia. In Blairsville we took 129 south to 180 and then got on 348 up into the mountains. Highway 348 led us down into Helen, Georgia. 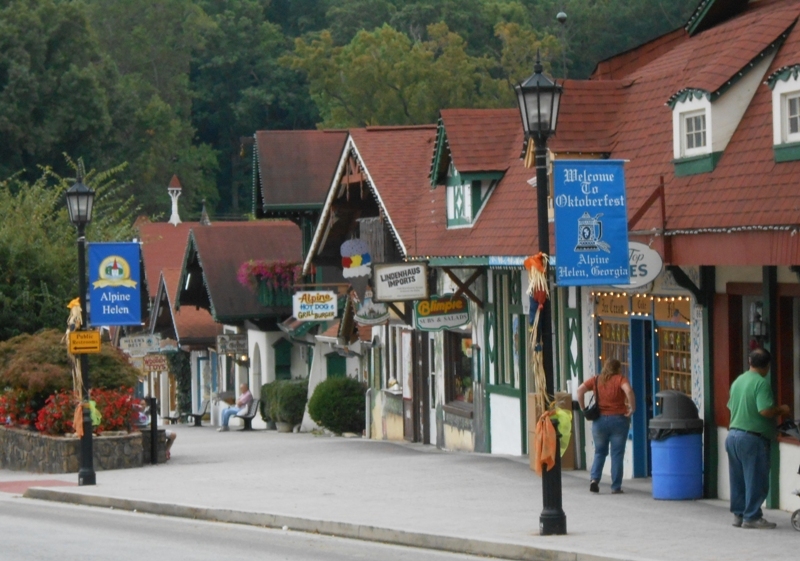 Helen is like Gatlinburg was thirty years ago, a Bavarian tourist town with a lot of little shops and restaurants. 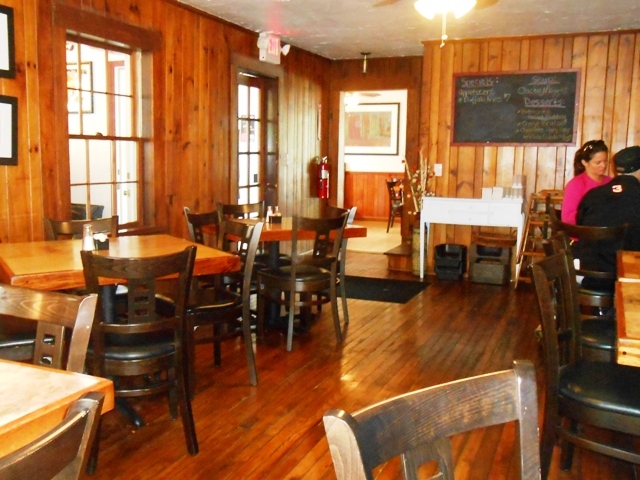 After driving once through town, we stopped at the Hog Pen Gap Grill for lunch. The Hog Pen Gap Grill in Helen, Georgia. In the front dining room. 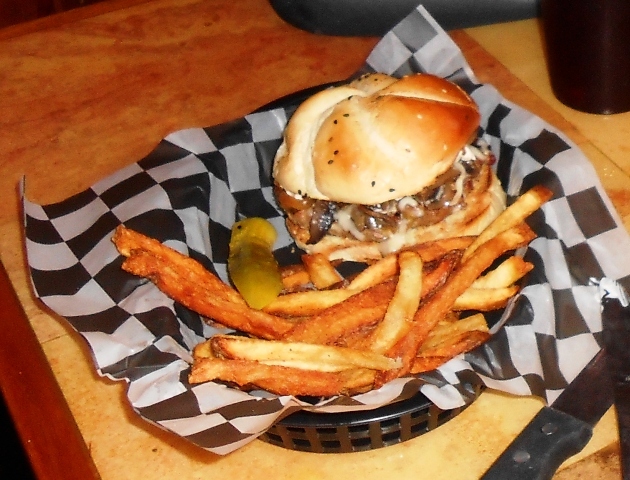 We both got a burger and fries. After lunch we walked a few blocks and snapped some shots. Another view down Main Street. This beautiful horse was huge! 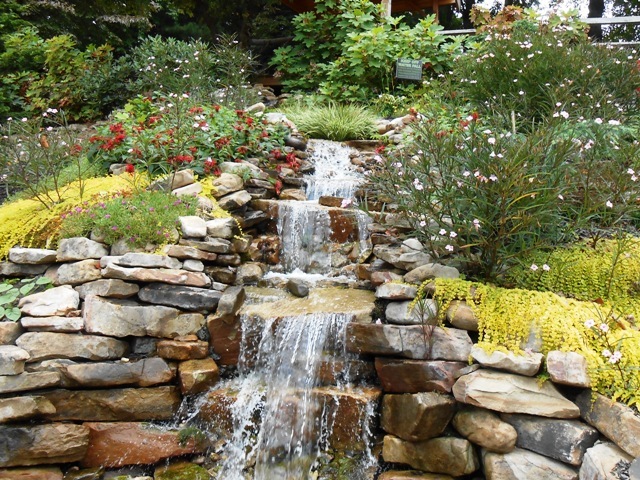 Alana Falls in the city of Helen. Then we hopped back on the bikes and rode up Main Street to visit Chattahoochee Biker Gear, the local Helen bike gear shop. They had a large stock of patches and t-shirts catering to the tourist trade in addition to gear for the cruising biker. 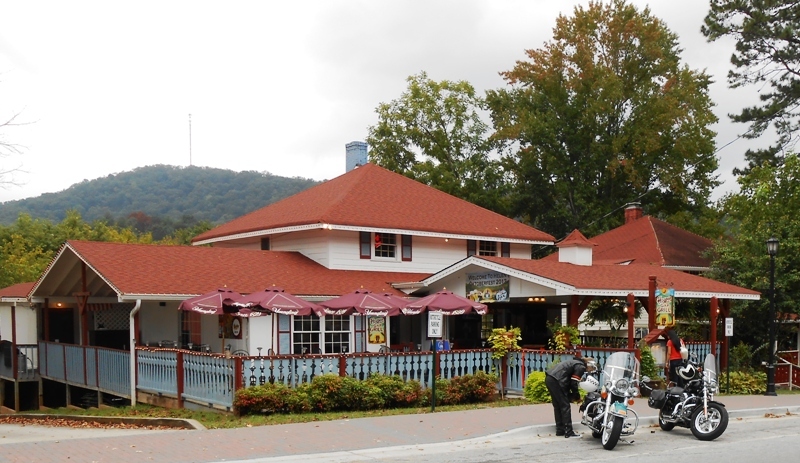 If you are in Helen be sure to stop in Chattahoochee Biker Gear! 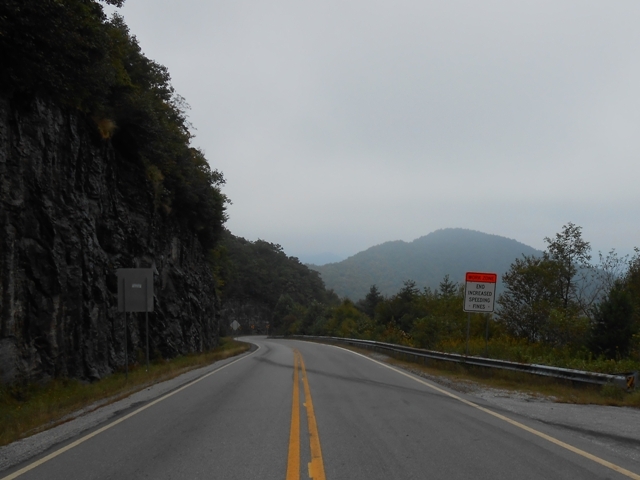 We then got back on the bikes and headed north on 71/75 up toward Hiawassee. We stopped to make a short video about the twisty highway. 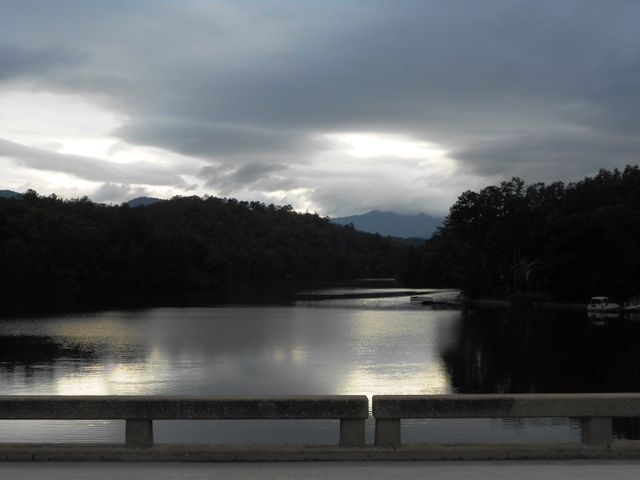 Once we got to Hiawassee, we stopped to fill up our tanks then took 66 back to Blairsville. 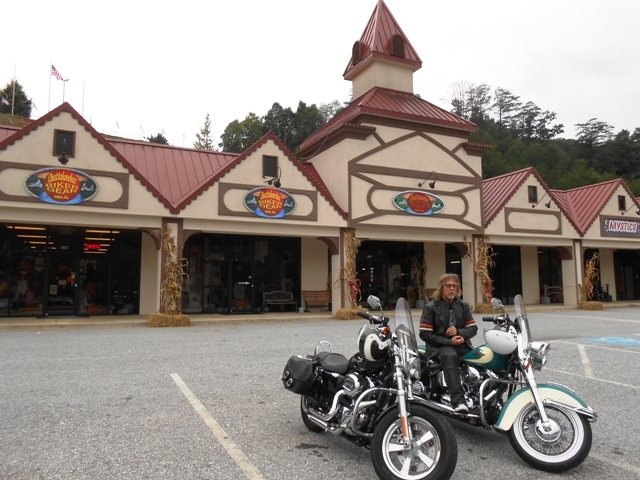 We stopped briefly at The Biker Barn in Blairsville. It was closed but looked like a good place to buy a trailer. 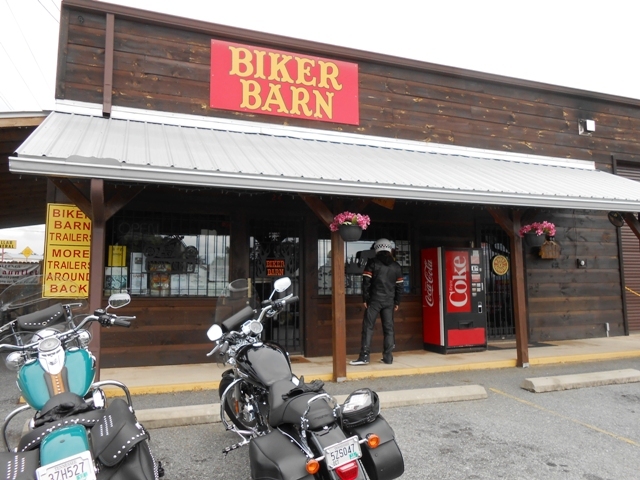 The Biker Barn in Blairsville, Georgia. 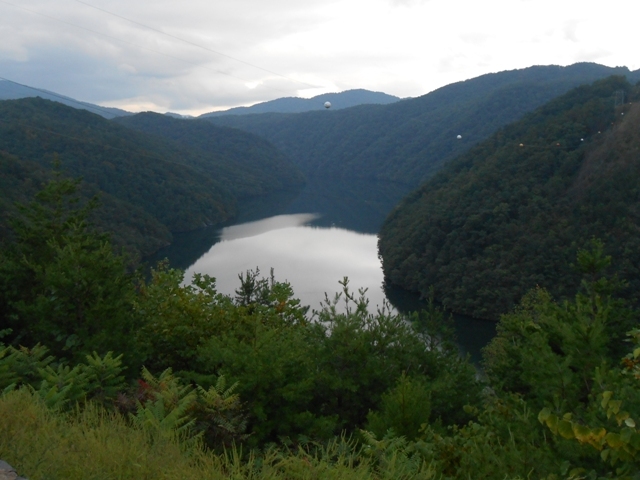 In Blairsville we took 129 north which took us by Lake Nottely and then up into North Carolina. 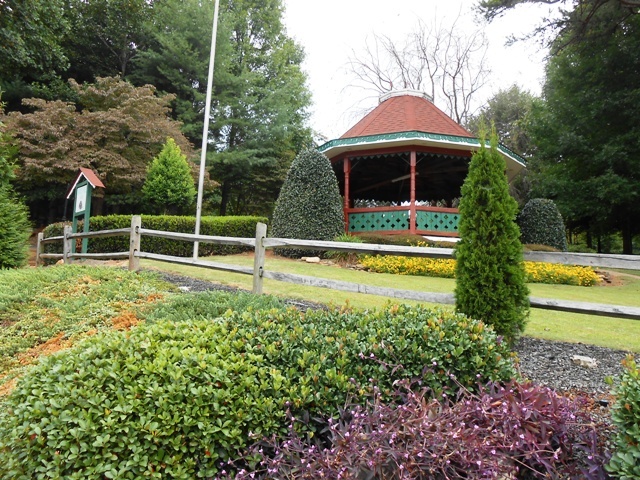 In North Carolina, we took 64 through Murphy, then Andrews and then into Robbinsville. 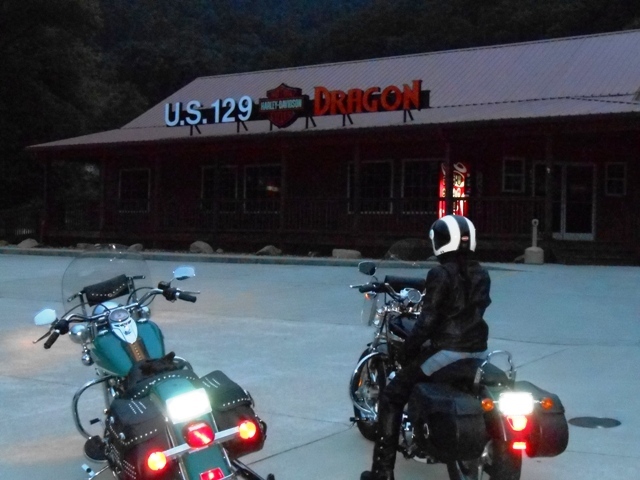 We left Robbinsville and headed down 129 toward the Dragon. 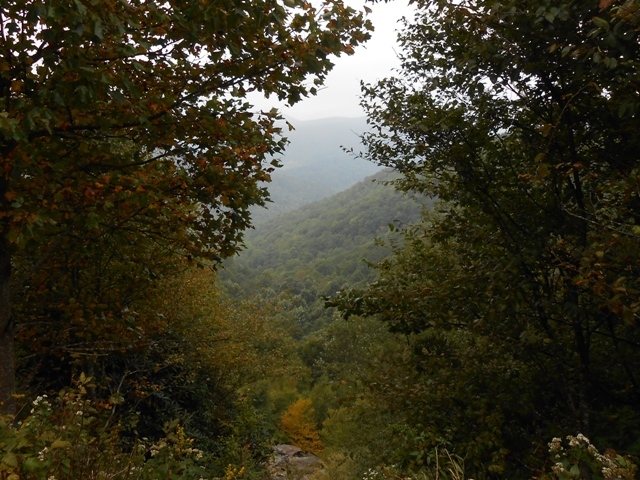 The scenery, of course, is gorgeous. On 129 heading toward the Dragon. View from bridge on 129. As we took photos from the bridge, a group of Corvette’s drove by. 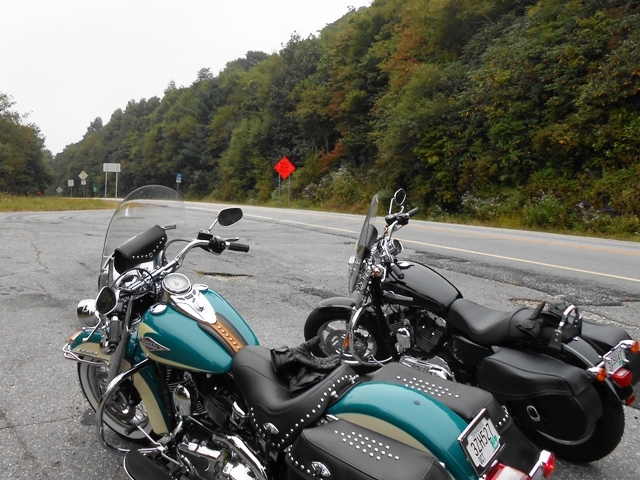 Before heading down the Dragon, we stopped at Deals Gap. 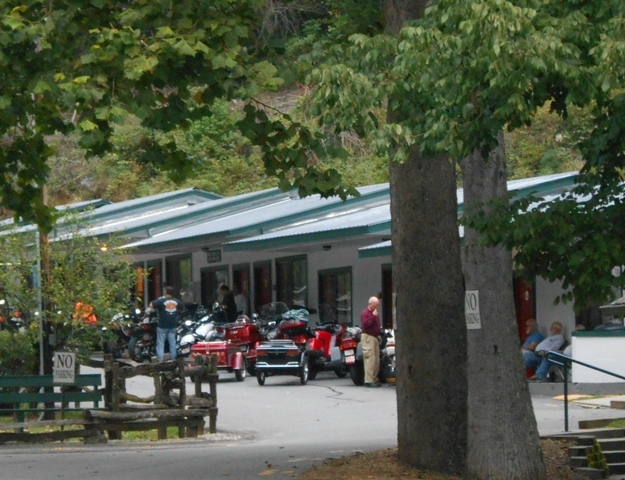 The resort at Deals Gap was full of bikers. 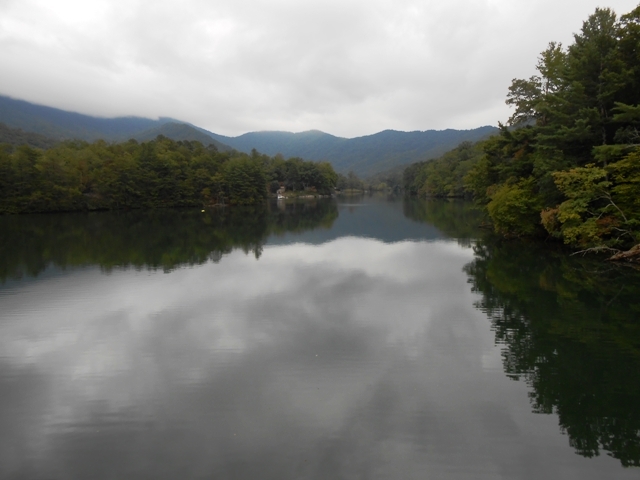 Then we rode down the Dragon stopping to observe the view midway. By the time we reached the end of the Dragon, the skies were turning dark. The skies were dark by the time we got off the Dragon. We continued on 129 into Maryville and then back into Knoxville and back home. We got home at 8:30pm, eleven hours after leaving home, and our total ride was 346 miles. We wore our full leathers the entire day! I was glad we had them. You can view our list of Day Rides by CLICKING HERE. 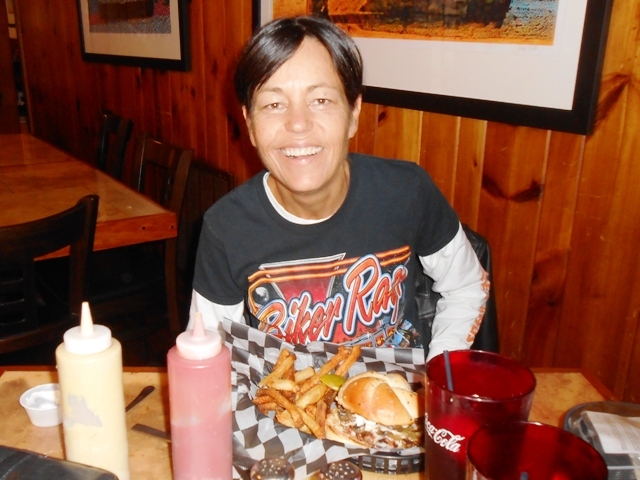 This entry was posted in Day Ride and tagged Biker Rags, Chattahoochie Biker Gear, Helen Georgia. Bookmark the permalink. Thank you! We were thinking of doing the same ride but starting from home here in Vonore! Glad you had a safe ride. Hi Connie- It’s a great ride. You guys might want to stay overnight in Helen too. The ride was fairly long for one day. Doable- but not much time to gawk in a one day ride. Thanks for sharing the link Deb! Looks like a great place to stay.